What is an enclosure map? 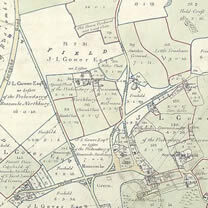 Enclosure maps were drawn up by surveyors, appointed by enclosure commissioners, to show the approved re-allotment of the open and common fields, and waste. The maps depict, in detail, a post-enclosure plan of the parish with the lines of the new boundary hedges or fences, drains, and roads. Occasionally the boundaries of the former open fields and commons are also shown. Is there a map for every award? No. Pre-nineteenth century enclosure awards are less likely to be accompanied by a map; instead the location of the enclosed areas is described in great detail in the award. Included in this project are eighteen awards, dating between 1736 and 1800, that do not have an accompanying map. However, by the end of the eighteenth century it was usual for every award to include an enclosure map. What does an enclosure map look like? Unlike tithe maps, there was no standard format for enclosure maps. They were drawn up over a long period of time using a variety of local practices and conventions: for instance you will find that scales vary, and that north is not always at the top of the map. They also come in a variety of shapes and sizes: some are rolled, some folded, and some are flat; some are very large and cumbersome (the enclosure map for Cholsey measures 3.5m x 1.7m), and some are quite small (the enclosure map for Lyford in West Hanney only measures 43 x 48 cm); some are drawn on parchment, and some on paper backed with linen. They are all hand-drawn and many are coloured. Is there a map for every parish? No. Even in the case of parliamentary enclosures, some awards were prepared without a map [see above]. Some parishes were enclosed by private agreement rather than Parliamentary Act, and such agreements rarely had an accompanying map. Why doesn’t the map cover the whole parish? The map only shows the area enclosed – occasionally this might be the whole parish, but more often it is only part of the parish, and sometimes the enclosed lands are dispersed around the parish. Why isn’t my house shown on the map? The inclusion of buildings on enclosure maps is usually incidental; the maps were drawn up to show the enclosure of the open and common fields, not the location of buildings. If buildings are shown they will appear only in block plan. The non-depiction of a building does not necessarily mean that no building existed on the site, but on the other hand the depiction of a building only proves that there was a building on the site, not that it is your building. What do the numbers on the enclosure plots refer to? Usually, each enclosure plot has its own number. This number appears on the map and in the award. Sometimes the acreage of the plot, in acres (a. ), rods (r.) and perches (p.), is also given on the map. The plot or allotment numbers refer to the award, where details of the allottee, acreage, and location of each plot is given. Sometimes there is also a schedule at the end of the award where this information is given in tabulated form. What else will the map tell me? Enclosure maps often provide the first accurate mapping of an area, and in some cases the first map. If you are interested in the history of a particular parish or area then it may be worth looking at the map to see if any incidental information has been included. Why does the Record Office sometimes hold more than one copy of an enclosure map? At least two copies of each map and award were made: one was to be held in the parish chest, and the other enrolled at the Quarter Sessions. Sometimes a third copy was also made for the local landowner. In most cases these copies are now with the County Record Office where they can be found in the parish collections, Quarter Sessions papers, or the estate and family papers. A full set of all Acts of Parliament is held by the House of Lords Record Office; an online catalogue of these Acts is available at the Access to Archives website [ http://www.a2a.pro.gov.uk/ ]. Copies of some local Acts may also be found at the Berkshire Record Office.